Here is how I play Minecraft: Step one: find a tree. Step two: build a house. Step three: walk in one direction for five minutes. Step four: get bored, turn off the game. If only there was something like Minecraft, but with tangible goals. And if only it was also… a JRPG? Dragon Quest Builders, which first came out in 2016 and launches today for Switch, takes the brilliant concept of Minecraft (also known as the brilliant concept of Infiniminer) and stuffs it with slimes, heroes, and princesses. If Minecraft puts you in a sandbox, then Dragon Quest Builders puts you in a sandbox where there are a bunch of half-built sandcastles and you have to help all the sand people fight sand demons and solve all of their little sand problems. Which is just so much more interesting. 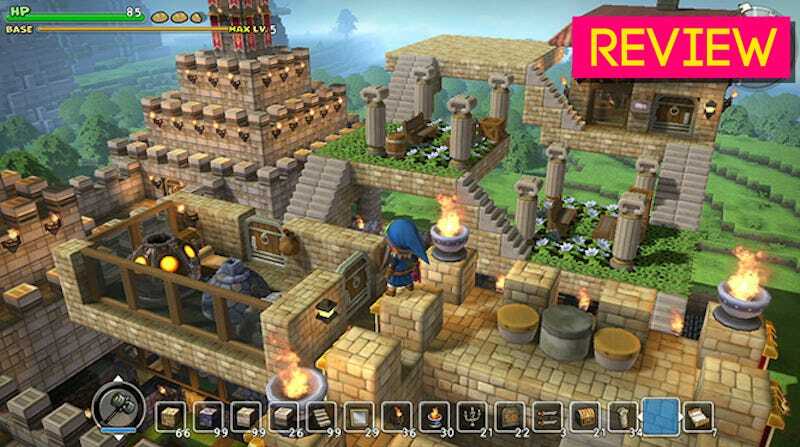 Dragon Quest Builders has the Lego-like premise of Minecraft, where every object in the world can be extracted in brick form and then placed elsewhere. It also has the exploration of a Zelda game, where a hidden chest or cool encounter might be behind that cave or on an island nearby. And it’s got a quest system reminiscent of the Super Nintendo classic Actraiser, asking you to build and maintain a town, helping its people solve problems ranging from menial (“make me a bedroom!”) to convoluted (“stop this giant golem before he kills us all!”). Add some Tower Defense and you’ve got a winning combo. Exploration and creativity make for a good combination. Can get a little repetitive; combat is very simple. Step three: Go out into the wilderness and fight battles. Step four: Go on diversions to hunt for secret items. Step five: Finish my quests. Step six: Upgrade my base a little. Step seven: Go do some more quests. And so on and so on. It’s a wonderful formula, enhanced even more on the Switch, with its big bright screen and comfortable convenience. Dragon Quest Builders is set after the events of the original Dragon Quest, in an alternate reality where instead of saving the world of Alefgard, the hero agreed to cooperate with the nasty Dragonlord and let darkness win. Playing as a reincarnated version of that hero called the Builder, your job is to reconstruct Alefgard, one brick at a time, saving all of its citizens along the way. It’s all spiced up by classic Dragon Quest charm and humor. Expect plenty of jokes about how, inexplicably, nobody else in the world knows how to build things. The game runs just fine on Switch, although there is one annoying quirk: To move, you have to use the left joystick, but when you open your inventory or craft items, you have to use the left directional pad. At first I figured this would be so you can move around while crafting, but you can’t—the left joystick instead does nothing. It’s an irritating part of an otherwise great port. There are four chapters in the game, each set in a different region of the world. The game starts off with the basics—build a room here, save a villager here—and then starts introducing more complicated gimmicks, asking you to fight monsters and track down exotic ingredients to make increasingly complex rooms. Later chapters have their own themes, like a swamp in which the citizens have been poisoned and you have to find a way to heal them. Each of these regions has its own city, so none of your buildings will carry over from chapter to chapter, which can be disconcerting. You might spent 5-6 hours on a town only to have to abandon it for the next one. But this isn’t a game about harnessing your creativity to build massive robots and giant penises. It’s a game about using bricks to solving people’s problems. By the third world, the formula starts to feel repetitive, but there are new items, recipes, and quests in every chapter. Some of the coolest building blocks aren’t available until late in the game, and you’ll be able to play around with new materials in every chapter. It is a drag that you sometimes have to re-learn recipes, but the ample opportunities to build from scratch serve as a challenge to build better and better towns in every chapter. With enough practice, you might be able to build towns that live up to those in Nintendo’s press screenshots. All four of Dragon Quest Builders’ worlds are full of hidden secrets. Explore enough in the first chapter, for example, and you’ll find boots that let you fall from any height without taking damage. Dig deep into a mountain later in the game and you might discover a labyrinth full of invincible skeletons and fireball traps. The combat never gets particularly interesting—you’re just dodging and smacking things with a sword or hammer—but hunting down new enemies and recipes remains fun. The game’s Minecraft trappings are somewhat misleading. 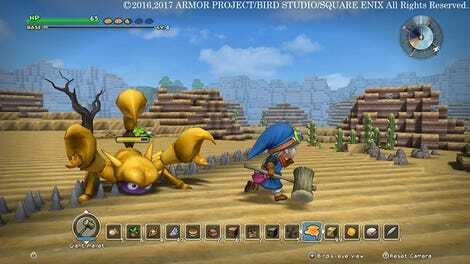 Dragon Quest Builders is less about creativity and more about strategy. It’s a hand-crafted, charming video game that starts off slowly but never stops feeling delightful.